Stems: Erect or ascending, usually much-branched, glabrous or hairy. Leaves: Alternate, simple, short-stalked, lanceolate to linear-lanceolate, 1 to 6 inches long, 1/4 to 1/2 inch wide, often with dark spot near middle of blade; margins entire; tips tapering to points; stipules tubular, with short bristles on top margins. 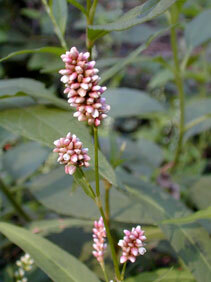 Inflorescences: Racemes, erect, less than 1.25 inches long, densely flowered, terminal and axillary. Flowers: Perianths less than 1/8 inch long, dull pink to greenish pink; perianth segments 5, united; tips free; stamens and styles not extending beyond perianth lobes. Fruits: Achenes, small, shiny, black. Habitat: Damp disturbed sites and waste places. Distribution: Principally east 3/5 of Kansas. Uses: Native Americans used the leaves to treat stomach pains and poison ivy rash, and rubbed the plant on their horses to keep flies away.